There is a lot going on in the works of Omaha-based artist Erin Foley that are currently on display in the Moving Gallery’s Gallery of the Zodiac space in the Old Market. In some of these minimal, geometric paintings, what’s going on is quite specific, however hidden from the viewer it might be. The four “groove” paintings, for instance, are not just lively works that in their angularity and shifting textures are suggestive of musical phrasing, or perhaps a reading on a heart monitor. These paintings are also enlarged depictions of actual grooves, i.e., the marks on vinyl records that produce sound. These works not only shift our perspective from the musical to the visual and from standard perspective to the near-microscopic, they also evoke a nostalgia for a pre-digital era when sound had a materiality that was obvious every time we set a needle on a spinning piece of vinyl. In other works in this show, the “origin” is more clear but no less intriguing. Of the twelve works, six derive their subject matter from tennis, of which Foley is an avid player. One doesn’t hear much about tennis in the art world, but one can see the influence of the sport on Foley’s work in subtle ways. One thing about tennis that is particularly striking in this context is that, like painting, it depends very much on the issue of surface. It matters a lot whether a match is played on grass, clay, hardcourt, or any of the other nine distinct surfaces defined by the International Tennis Federation. After a well-placed shot, players, referees, and audience members alike will stare at a small area of the court to see if the ball left a mark on or just beyond the baseline, to see if it “caught the line” that defines territories of triumph or defeat. If played well, tennis is a dance along the lines. This dance is what came to mind as I found myself scrutinizing the surface of Foley’s paintings. With one exception, all of the paintings in this show are on muslin rather than canvas. Muslin is more absorbent than canvas, and this heightens the contrast between the hard white lines that seem to sit on top of the images and the expanses of green that unfold beneath them. The paintings “Court 1” and “Court 2” beg to be examined for signs of the player, the artist. These are large paintings with a downward-slanted view of a tennis court, as if the viewer is assuming the perspective of some skycam whirling by above. Foley’s works are not like this. For her, the patterned surface of a tennis court is not just a springboard to abstraction, but one of the frameworks that define her days. 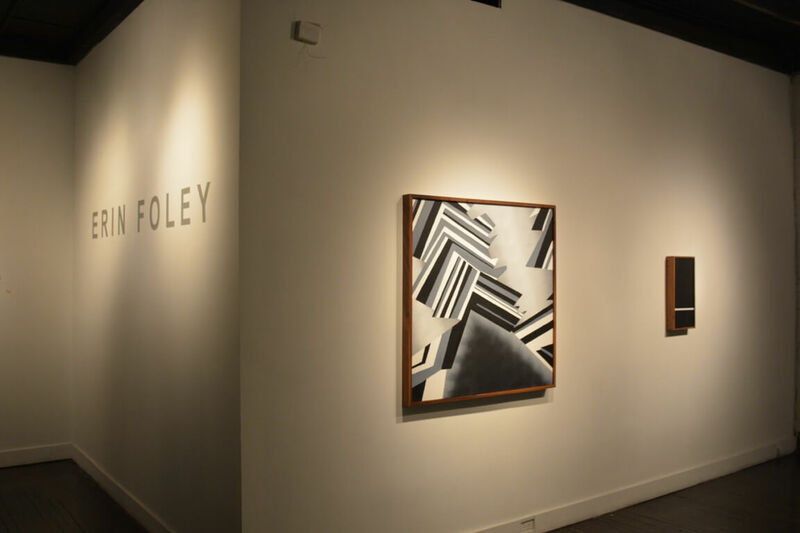 To make this point more definitively, Foley includes in the show one work on paper that is drawn from another framework, an accounting ledger. It depicts the checks and other marks that many, including Foley herself, encounter in their day jobs. Foley calls this work “Letters from a Young Realist,” as if to suggest that these marks, and what they symbolize in terms of profit and loss, are for many of us no less real than a computer or a car. One can’t help but look forward to a future exhibition drawing more heavily on accounting. Foley is an artist who is fascinated by the point at which the natural becomes the abstract, where the real becomes the symbolic, and vice versa. In the artist statement accompanying this show, Foley indicates that she is not “allied with a particular medium,” but I humbly beg to differ. This is an artist who loves painting, who believes that a hard edge sitting atop a surface says something different from a misty transition of paint emanating through it. This is a show that rewards quiet viewing, and one leaves the gallery seeing the world and its patterns a little bit differently. The exhibition of Erin Foley’s work continues at the Moving Gallery’s Garden of the Zodiac space in the Old Market until April 14, 2016.